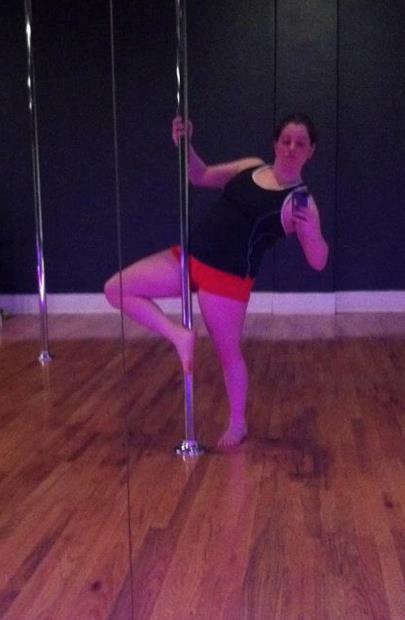 If someone had told me two years ago that I’d nearly be spinning in circles on my head, swinging around a pole, getting jazzy with it, or frequenting a fitness based Caribbean reggae dance class three-four times a week by the year 2013, i would have laughed in their face. Two years ago, I was the girl who walked out of Zumba classes because she couldn’t follow the steps of the instructor and felt too embarrassed to go on. Two years ago, I was the girl who judged herself against the professional dancers and professional fitness instructors in infomercials who appeared flawless. Two years ago, I was the girl who didn’t give herself a chance to last through a dance class because she had given up before she had even stepped up. What I didn’t realize two years ago was that by not giving myself a fair shot–or the classes themselves a fair shot, I was holding myself back. And the truth is that too often, that’s what we do: We give up amazing opportunities before we even give them a chance, and in the end we only hold ourselves back. So what exactly was I holding myself back from? I was holding myself back from learning to love dance–I was holding myself back from learning to love the way my body moves when I just let it–I was holding myself back from being free and I was holding myself back from…well…put simply–I was holding myself back from learning. And I LOVE learning. I always have. I recently had an epiphany, and when I say epiphany, I mean a full-on lightbulb popped over the head, type of epiphany. The epiphany itself nearly knocked me off my feet. So after class I decided to sit and compile the five biggest lessons that dance has taught me not just in terms of dance…But also in terms of the bigger picture: Life. After reading through, I hope you’ll share some of your favorite life lessons you’ve learned through the activities you’re most passionate about. 1. No one is judging you. Well-Okay maybe one person is. And that’s you. But you shouldn’t be. Getting to the class in the first place is something to be proud of. Getting up and out to do ANYTHING you set your mind to is something to be proud of, especially when the weather–or our moods–or our mind is telling us otherwise. 2. There isn’t an exactness to everything you do. In dance, if the teacher is getting her JLO on and you want to get your Beyonce on during a booty shake then by all means get your Beyonce on. Or men if you want to shake it like Michael when the teacher’s getting down like JT–then just do it. Add YOUR flavor. Just whatever you do–own it. Same goes for life: Own EVERYTHING you do–and never–EVER–stop. 3. Do it wrong. So I cheated on this one. I took this lesson from not just dance class but acting class as well. Do it all wrong. We learn from our mistakes. Our muscles learn from our mistakes. And questions are okay – no wait–they are great. Sure, teachers love flash mobs of amazingness but they don’t teach so that perfectionists come in. They teach because they want people to learn, they want people to get excited about being imperfect sometimes, they want people to embrace their passion. Part of the fun of a class –ANY class– is working your way up. Part of the fun of any challenge you take on in life is getting knocked down and feeling the sense of pride in getting back up. 4. “When you assume. You make an a…” We all know the saying. We can’t judge a class–or a situation in life– before we even step foot in it. Not only does it reinforce any stereotypes or preconceived notions we have about the class/activity/event, but it also holds us back from possibly finding something we are truly passionate about. Prior to the hobby year, not only had I convinced myself that I wasn’t a dancer–but I had convinced myself I wasn’t fit for group classes at all–that I didn’t fit the “look.” You know the “look” I am talking about–the look it seems that all the people have who participate in infomercials for the latest Zumba videos or aerobics dvds. The men are shirtless and ripped; the women are in sports bras and spandex–chiseled. That belief I concocted from stupid infomercials was wrong. In each and every dance class I’ve participated in this past year, people of all sizes and of all attire are taking part. People of all sizes and all attire are having a really amazing time. I choose to rock my college field hockey shorts and a white T. Cause that’s comfy–and cause that’s me. (And sometimes me –and sometimes comfy is a tiger suit–see last picture on the page). 5. The most important lesson of ALL. Just freaking dance like no one is watching. Please, I beg you. Refer back to number 1: no one is watching. The world is a wide open dance floor just waiting for you to dance on through, to make your art–to make your life. So go on. Yes YOU…YOU and even YOU.. Dance. Dance. Dance. Posted in Fitness, Fun, Happiness, Health and tagged beyonce, bigger picture, choreography, dance, Failure, fear, hip hop, infomercials, J Lo, justin timberlake, Life lessons, Madonna, Michael Jackson, pole dancing, Pon de flo, rhianna, scared, zumba. Bookmark the permalink. It’s nearly been a year since I walked myself down to Occupy Wall Street the morning after the park was raided and the media was blacked out in downtown New York City. I was horrified at the unimaginable thought that people were beat and kicked out of their home at the late hours of the night–without a voice being able to tell what was going on. After visiting the site, I proclaimed that “no one could take your voice” in a blog post. Several days later, my good friend Laura joined me as we marched with the union across the Brooklyn Bridge to voice our beliefs. So it’s no wonder that the same person who helped me to find my voice during Occupy Wall Street–is the same person who helped me to find my voice during a singing lesson on a Tuesday night. As a kid, I always wanted to be in the talent show–as a singer. I remember walking up to the mic in 3rd grade, and raspilly singing, “I Believe I can Fly,” pretty terribly. Somehow, I didn’t let it scar me for life–and in 4th grade I convinced a group of four girls to let me sing Celion Dion’s “My Heart Will go On” in auditions for the show. We didn’t get in. But I still sang on. I found comfort in blasting music and vocals in my car when I finally had a license–and singing at the top of my lungs. And then I discovered karaoke in college—which of course allowed me to choose fun songs–rather than serious songs, and just have a good time. Hello ‘N Sync–Helllllo Spice Girls. But deep down inside, I’d always wanted to be in plays–in musicals in high school, but I never had the courage to try out–because I knew my voice was no match for the last year’s lead. So I never tried out, and for good reason–I had already convinced myself that I was tone deaf–and when we’ve already preconceived beliefs–they tend to come true. I never found my voice. That is until, I headed over to Laura’s apartment and she took the time to teach me correct breathing–explain why I might be nasally–showed me how to find a note–did several vocal exercises–and then took me through the chorus of the popular Michael Jackson song, “Billie Jean.” By the end, I was exhausted–I could feel my vocal chords screaming for a break. But inside my heart was beating quickly. It was a good exhaustion–the kind where you feel like you’ve pushed past a barrier–and exceeded your own expectations–the kind where you’re thankful you had a friend along for the journey. I had found my voice–at least for that night. Thanks Laura. Posted in Happiness and tagged Assorted Animals, Backstreet Boys, Billie Jean, Breathing, Bridges, Exercises, Laura Fisher, lesson, Libby Segal, Libs, Michael Jackson, Musicals, nsync, Occupy Wall Street, Plays, Singing, Songs, Spice Girls, the hobby hoarder, Vocals, Voice, yellow sunglasses. Bookmark the permalink.